So this weekend past my sister Sophie flew home from Edinburgh to accompany me and my two other bridsmaids dress shopping for bridesmaid dresses. A lot of people have been asking me to post regular updates on my wedding planning on here, which I have wanted to do but found very hard! I wanna share details with you but yet I want everything for my guests to be a surprise until the day & saying a lot of friends attending my wedding read my blog Ive struggled with how to share things about it before the big day. So I thought id share one of my mood boards with you guys... 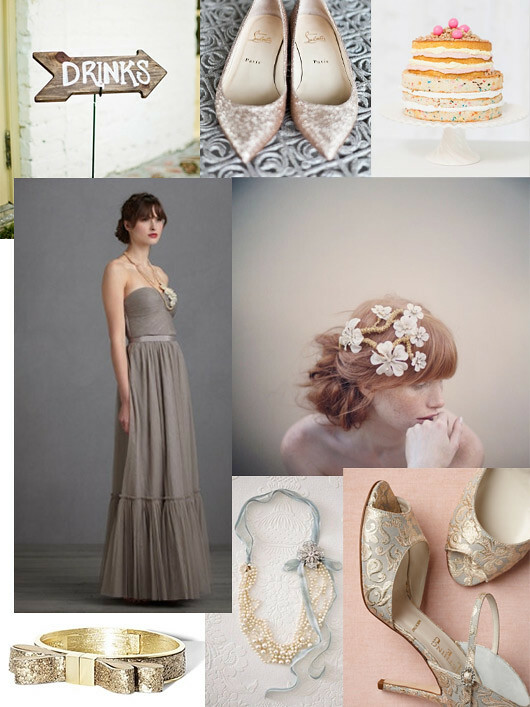 I put these together quite often with images Ive found from various sources mainly pinterest, bhldn & one fab day. Now that I have decided on my wedding dress and my bridesmaid dress style and colour a lot more things can be organised! Im now looking at what kind of shoes I want. I dont think Ill go for the traditional ivory shoe... Im thinking either a guilded gold shoe or maybe a shade matching the bridesmaid dresses? Jewellery is another thing that is important to me for the big day, my engagement ring and all my jewellery infact is gold so Im looking to keep things on this colour palette but simple and understated aint really me so something heavily bejwelled possibly vintage is what Im looking for. Dave & I will also be cake taste testing soon... yum yum! I wasnt really fussed on cake to be honest but I love this sponge and butter cream cake with sprinkles featured above. How fun? This was the cake I was going to go for at first until I was told that it would dry out incredibly fast not being iced... no one likes dry cake! So Im back to the drawing board on that one. This is all so gorgeous, Vicki! Wedding planning is such fun!! I see so many girls stressed about their wedding, it's nice you're enjoying it. Pinterest is so great for things like weddings - I wish it had been around when I was planning mine! OOoo, beautiful! Especially love the necklace with the blue! I know what you mean about wanting to share enough without it slipping into the "gave too much away" category. I think this is a good compromise! More power to you for seeking the type of union that is right in Gods eyes. How brave of you!